The Givi XS307 is as you'd expect any Givi product, quality. The XS307 has been specifically designed to complement Givi's innovative "Tank Lock" system. The Tank Lock system allows the tank bag to be fitted to your bike without the need to use magnets or straps whilst keeping re-fueling easy. The Tanklock system requires a specific motorcycle fitting kit also available from us. 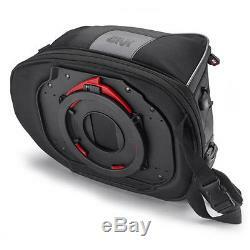 Specification for Givi XS307 Tanklock Tank Bag. Constructed from 1200D Guzy Nylon with PU inserts. Reflective inserts Weatherproof internal compartment to store raincover Please Note: TankLock Ring not included. 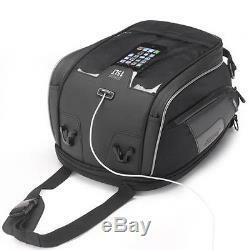 Bike specific tank ring needed to fit this bag. 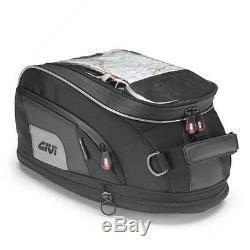 WE ARE AN AUTHORISED GIVI DEALER SPECIALIST FITMENT & SUPPLY CENTRE. Welcome to Hermod, your number one shop for all things motorcycle. We are a family run business with over 45 years experience and were dedicated to giving our customers the very best of motorcycle apparel, luggage, accessories and parts, with a focus on quality, service and uniqueness. We hope you enjoy our products as much as we enjoy offering them to you. If you wish to visit our showroom for a specific product, please call beforehand to check stock prior to leaving to avoid any disappointment. We understand that from time to time you may wish to return a product to us. Please make sure the item has been correctly packaged with outer packaging like how it was received. 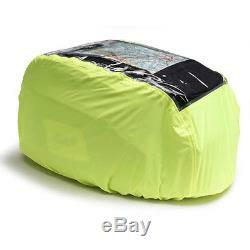 Airhawk Cruiser R - Motorcycle Seat Cushion with outer cover. It`s finally here and New to the Airhawk family of Motorcycle cushions - the CRUISER R! Made from neoprene this new model is designed to address the issues of prostatitis, general discomfort in the sacrum and coccyx, as well as under the prostate and scrotum. As with all our other motorcycle cushions the Cruiser R provides the same effective force redirection with interconnected air cells, but with a new cell design to provide added comfort and address specific pressure areas. The Tent Bag is an additional bag for fitting on a tail bag. It fits a standrad 2-man text and is easy to attached with D-rings on our Speedpack, Racepack and Cargobag. The Respro Foggy Breathguard is the unique neoprene guard that prevents your visor from fogging up. The Foggy mask prevents a major problem for all bikers and pillion riders. It works with full face motorcycle helmets, installation is simple, never has to removed once fitted (except for the occasional machine wash). It requires no maintenance at all, you simply fit it and forget it. The days of lifting up your visor whilst stationary at traffic lights are over if your helmet has a Foggy! The Foggy mask prevents one of the biggest problems riders and pillions have, a foggy visor. The item "Givi XS307 Motorcycle Tanklock Ring Tank Bag 15 Litre Black" is in sale since Sunday, February 21, 2016. 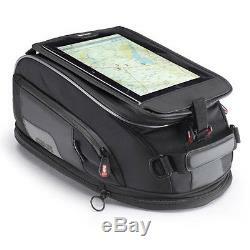 This item is in the category "Vehicle Parts & Accessories\Motorcycle Accessories\Luggage\Tank Bags". The seller is "hermod_24-7" and is located in Team Valley, Gateshead, Tyne & Wear. This item can be shipped to North, South, or Latin America, all countries in Europe, all countries in continental Asia, Australia.